This Timney trigger is a true self-contained, 100% drop-in ready upgrade that will change the way you think about AR triggers forever. 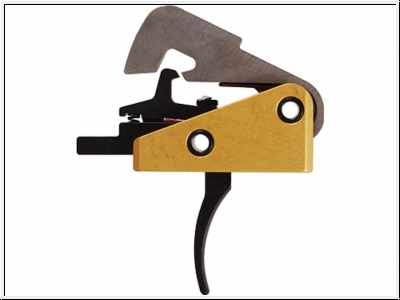 Comes with a factory 4 pound pull, this trigger can be installed in minutes without any gunsmithing, fitting or adjustment required. The trigger makes use of your rifle's original hammer/trigger pins, due to its proprietary design the trigger eliminates pin rotation and walkout. The solid, straight design of the trigger shoe is great for competitive events, helping the shooter pull the trigger straight back to the rear without influencing the rifle's alignment with the target. The housing is machined from lightweight 6061 T6 alloy which is anodized for superior durability. The hammer is EDM machined from S7 tool steel and features a Nickel coating which helps deliver the exceptionally smooth, crisp single-stage pull. The other components of the trigger are EDM cut from A2 tool steel, then heat treated to Rc 56-60. This Product was added to our catalogue on Tuesday, 21. October 2014.